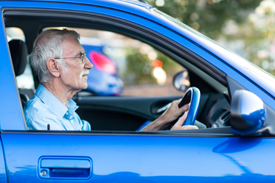 Growing older doesn’t mean an end to being independent and enjoying the freedom your car gives you. It is important that when nature begins to tell you to slow down, you recognise that your driving will be affected. We all think we drive better than we actually do no matter what age we are. The good news is that by changing the way you drive just slightly, you should be able to carry on driving and enjoying it more safely. Leave a bigger safety gap in front of you this will give you more time to stop in an emergency. Avoid driving if you are tired or feeling unwell. Remember that alcohol slows your reactions still further, never drink and drive and remember coffee does not sober you up. Suitable regular exercise, both mental and physical, can help to restrict the slowing down effects of ageing. Take your time making your decision. You may feel other road users are impatient and this may cause you to hurry, with the result that you are far more likely to make mistakes. Plan your journeys so that you avoid busy or difficult junctions (particularly right turns) and peak traffic times, this will help you to not feel so rushed - if you find motorway driving stressful, try and avoid it by taking an alternative route. Looking further ahead as you drive may help you see problems before you meet them head on, and you may have more time to plan what to do. Take extra care at junctions check and check again before pulling out. Allow plenty of time for your journey and take regular breaks if your journey is going to take more than two hours. Try to recognise which situations make you feel tense and avoid them. If you or your partner can both drive you may wish to share the driving. This will help keep you both in practice, and reduce the amount each of you has to drive. If one of you has to give up driving, the other will still be confident enough to drive and your normal routine won’t be get too disrupted. Remember that drowsiness is made worse by alcohol and by some medicines (whether prescribed by your G.P. or bought over the counter at the pharmacist). It is important to have your eyes checked regularly by a qualified optician and wear any glasses prescribed for you. You may want to avoid driving at twilight or in the dark because as you get older your eyes react much slower to changes in the light. Recovering from being dazzled can take longer. Do not wear anti-glare glasses as they cut down the amount of light reaching the eye, not just from oncoming headlights. If you suffer from arthritis or stiffness of the joints which restricts your movements, then your observation is likely to be affected. If they are not already fitted to your car you might choose to fit special “blind-spot” rear view mirrors to help. Regardless of age all drivers should remind themselves from time to time of the Highway Code and keep up to date on new traffic laws and road signs. Take a look at stillsafetodrive.org.uk for tips and advice if you or a loved one’s deciding whether it is still safe to drive.